Selma looks into all aspects of your life and puts together an individual investment plan that fits your goals and future. She accompanies you and will keep your investment plan on track for years to come. Tailor-made for you, Selma puts a plan and a strategy together that work for you and your future. By Selma, your constant companion and investment assistant, as well as an attentive (human) support crew. One of the things that seem difficult when investing is your tax situation. Selma provides you with everything you need. What does Selma do then? Selma puts your investment strategy into action. She knows exactly what to do, because of her deep insight into the market and managing all kinds of investment products. She looks at market conditions, figures out the right time and starts investing your money step-by-step. Your life and your investments should match. Personalised interaction by Selma makes sure investments always fit your situation. You lean back, make sure you are able to keep money on the investment account for at least 3-5 years in order to get the benefits of your long-term investment strategy. Why? Simply so Selma can make sure, the investment strategy still fits your life, your "private banker" tries to tailor everything to you as much as possible. What does the bank do? Banks (especially the Swiss ones) are very good at keeping money safe. Did you ever see the Gringotts vaults in Harry Potter? Assuming there are no dragons living in Switzerland, we’re saying your money should be pretty damn safe there. Selma is a regulated wealth manager in Switzerland. 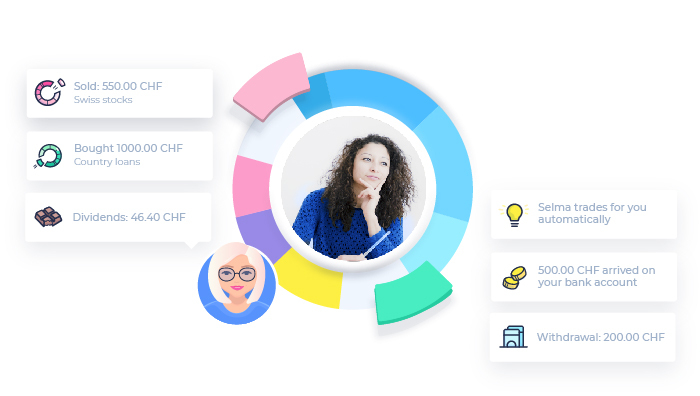 🇨🇭 This allows us to manage your money. The account with Saxo Bank (Switzerland) is in your name though - this is why you can withdraw money, transfer money or close your account at any time. We will focus all our energy and expertise on managing your investments, weil the bank does… well all the bank stuff.